Just down the block from where I had been taking take Happy Meal for his haircuts was Earl's Gourmet Grub. I had been meaning to stop in, but since it was a breakfast and lunch only shop (most days), it had been tough to work it in. Fortunately, Chi Burger was down for a lunch burger, so we rolled over in his mobile ashtray to see what gourmet grub was all about. At noon on a Thursday, we found metered parking in front of the 1/4 full restaurant, and we encountered no line when it came to ordering at the counter. I was not convinced that "gourmet' meant what they thought it meant. The counter staff was sarcastic, dismissive, and uninformed when it came to the ingredients. The cut of beef was a mystery. When I asked about the origin of the produce, the answer was, "the ground." I hoped that the kitchen was more on their game than the individual at the register. We did get a 10% discount on the $9.00 The Earl's Burger for knowing the phrase of the day, which could be found at www.earlsgourmetgrub.com. Our meals were ready in about 12 minutes. 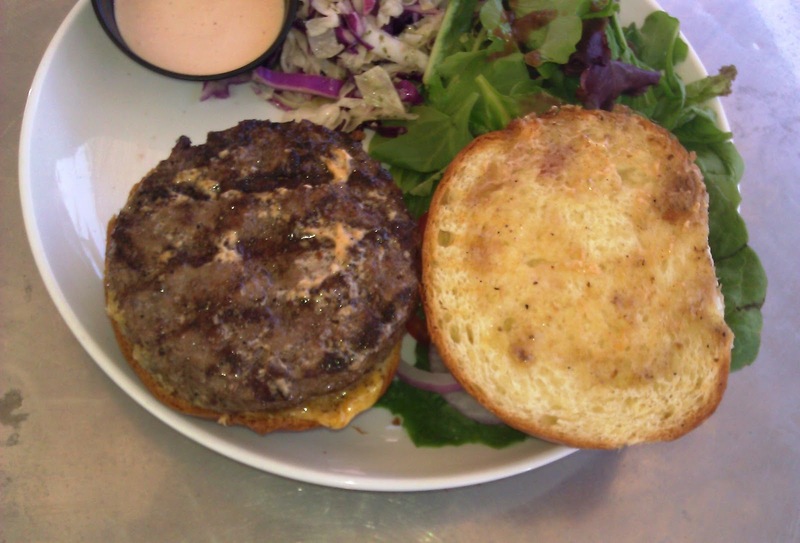 The Beef: Earl's Gourmet Grub made use of Niman Ranch beef. The one-dimensional flavor led me to assume that the cut was Chuck. The burger patty was juicy, and it carried a nice beefy flavor. That was it in terms of flavor, though. No minerals, no funk, no nothing. The fat content was most likely 20%, but that was a guess, since the counter staff was clueless about the menu. The Seasoning: The cheeseburgers at Earl's Gourmet Grub were properly seasoned with a salt and pepper blend while on the grill. The Sear: The tiny gas grill at Earl's Gourmet Grub imparted about 50% of the amount of sear that would have made the burgers interesting. The grill marks were present, but the sear was not crisp, dark, or deep enough to enhance the flavors of the average-tasting burger patty. The Preparation: The burger patties were straight-sided and uniform in thickness, so it was assumed that the burgers were pre-formed using a mold during morning prep. Either that, or they were pre-pattied by the purveyor. The grind was medium. The pressure used to create the patties was also medium, so the bite was firm without being chewy. The kitchen nailed my Medium cooking request. I did make a point of ordering everything on the side. When I flipped over my burger, I noticed that they had applied sauce to it, and then kind of, sort of, sloppily wiped most of it off. Weak. 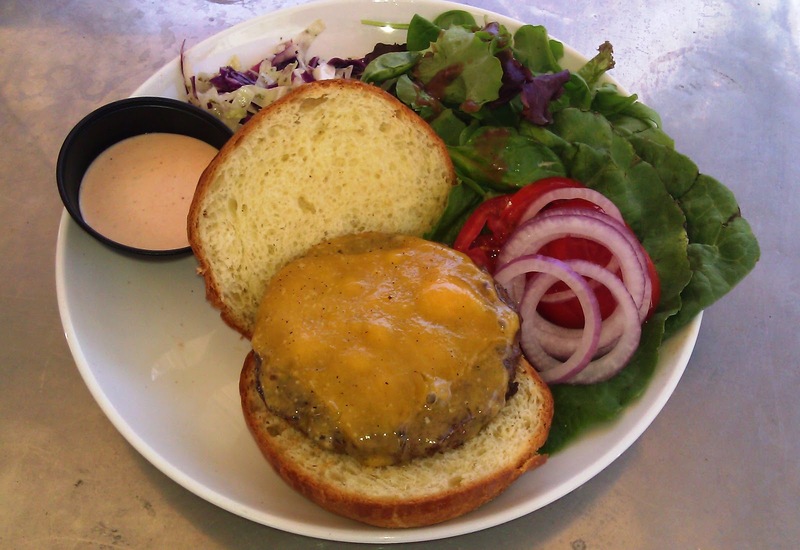 The Cheese: The cheese part of the cheeseburger was Tillamook Cheddar. The nine-month aged Cheddar was melted well, and it was relatively flavorful, but it was lost in the unforgivably cold bun. The Bun: The buttery brioche bun at Earl's Gourmet Grub was provided by Homeboy Bakery. This bun would have been spectacular had it been warmed up. The brioche had a layered, croissant-like interior. Sadly, since the bun was cool, those buttery layers were not luscious--rather they were overly springy and a little greasy. The cool bun chilled the cheese and the burger and robbed the dish of any savory notes. 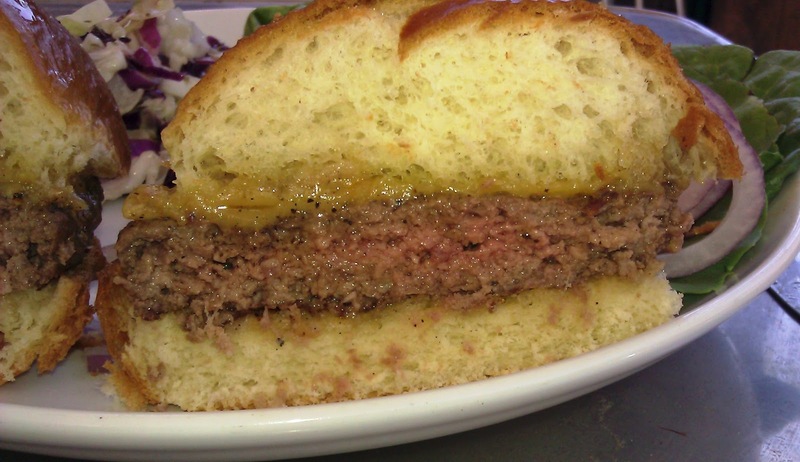 The cool bun also caused the cheese to loose its gooeyness and become dense. Finally, the bun was freshly oiled on top, and this served to round out the unpleasantness--it was greasy in the hand and the mouth. The Meat To Bun Ratio: Had the bun been toasted, Earl's Gourmet Grub would have nailed this. Since the bun was chilly, the ratio was skewed, unfortunately, toward the bun. The Fries: The were none. The Toppings: I was grateful that I ordered my veg on the side. 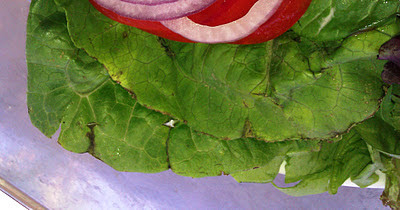 The lettuce was so far past its prime that it had deep veins of black rot. The tomato, on the other hand, was wonderfully juicy and fresh. The Value: With the 10% discount, each burger was $8.10, before tax. No fries, rotten veg, laughable service, and a cold bun all ratcheted the value down from a grudging "OK" to a well-deserved "mediocre." In the case of Earl's Gourmet Grub, the cheeseburger was most certainly less than the sum of the parts. The word "Gourmet" must have been code for "Careless."